The Kokavil tower, the tallest multi-purpose transmission tower in South East Asia, will be opened by President Mahinda Rajapaksa on June 6. Addressing the media in Colombo yesterday, Media and Information Ministry Secretary W B Ganegala said that the people living in the North and Vanni will be able to have clear TV and radio reception after 30 years with the setting up of this tower. Around Rs 450 million has been spent for the construction of the 174 metre tower which is situated at Kokavil, the centre point between Jaffna and Vavuniya. 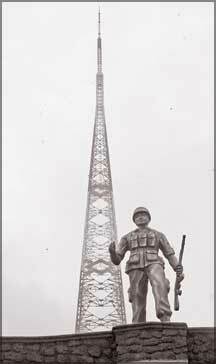 The tower is to be utilized for television, radio and telecommunications transmissions as well as military communication operations. The project was carried out under the supervision of Economic Development Minister Basil Rajapaksa on the instructions of President Mahinda Rajapaksa under the Uthuru Vasanthaya programme. It will provide television, radio and telecommunication coverage to the entire Northern Province which was devastated by the 30 year conflict. Ganegala said that the tower which was initially constructed in 1982, was destroyed by the LTTE in July 1990. Television and radio transmissions were interrupted in the entire Northern region after the tower was destroyed. Now the people of the North have the opportunity to watch television and listen to the radio without transmission interruptions after several decades. He said that the foundation stone to construct the Kokavil transmission tower was laid in March 2009. The construction of the site came to a standstill for six-seven months due to floods in the North. The transmission tower was constructed with the consultation of local engineers and using Lankan manpower supervised by the Central Engineering Consultancy Bureau Sri Lanka. The Army made a tremendous contribution to the project by providing security and supervision. The Sri Lanka Broadcasting Corporation, Rupavahini Corporation and the Independent Television Network commenced test transmissions in April. "We also expect to give an opportunity for a few privately owned TV, radio and telecommunication networks operations to use this tower in the future," he said.